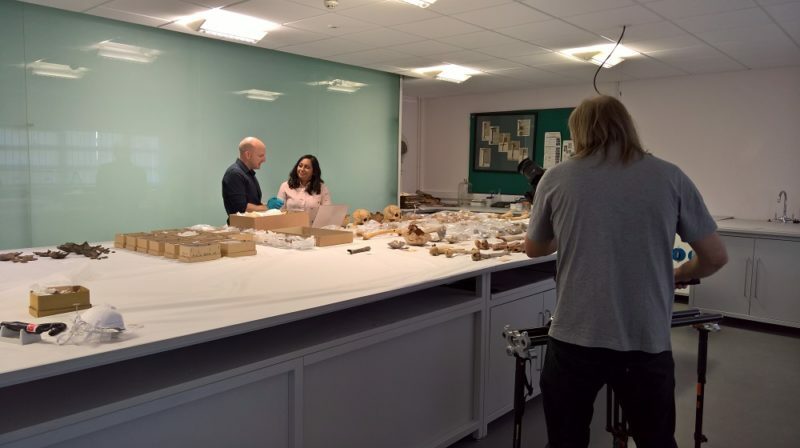 During the summer of 2018 Dr Richard Madgwick, an archaeological scientist at Cardiff University visited the Somerset Heritage Centre to look at the remains of 130 people held in collections cared for by the South West Heritage Trust. The collections belong to Somerset County Council, North Somerset Council and Glastonbury Antiquarian Society. With four undergraduate students he examined the remains and, as appropriate, to take samples. By looking at how bacteria attacked the bone microstructure, it was possible to discover how the remains were treated immediately after death. Different funerary practices leave different traces of bacterial attack. The team discovered that excarnation – exposing a body to the elements through so-called ‘sky burial’ – was rarely practised in Somerset. Instead it seems that most people were buried soon after death but dug up when soft tissue had rotted away. Some bones were then extracted and circulated or curated before being deposited elsewhere. Isotope analysis on surviving human teeth allowed the team to work out where 40 of the individuals had grown up. It seems that 31 people were probably raised in Somerset and nine came from further afield. Of these nine, three were probably from the Mediterranean and one from Brittany. The team discovered that people’s remains were treated in the same way after death regardless of where they were from. Whether people had met a violent end or had died naturally also made no difference to their treatment. The project has greatly enhanced our understanding of Iron Age Somerset, suggesting that it was a more multi-cultural place than we knew.